Researchers at Leeds in the UK studied how medieval soldiers were affected by the weight of the armor (approximately 40-50 kg or 80-90 lbs). 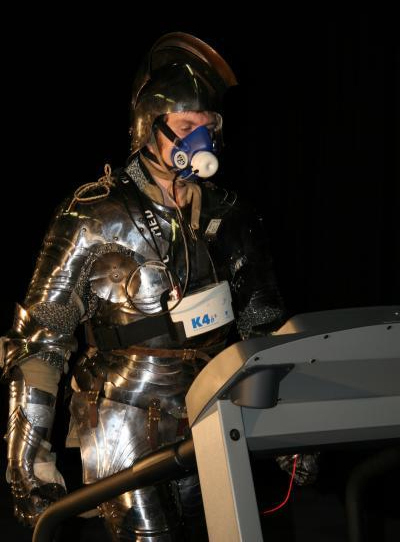 Researchers wore replicas of European armor while monitoring oxygen usage. The subjects’ breathing was more frequent and shallow as they used twice as much energy just to move around. “Being wrapped in a tight shell of armour may have made soldiers feel safe,” says co-investigator Dr Federico Formenti from the University of Auckland. “But you feel breathless as soon as you begin to move around in Medieval armour and this would likely limit a soldier’s resistance to fight,” Heavy Metal Hardens Battle: Body Armor Hindered Medieval Warriors, Science Daily. It was interesting that the researchers mentioned that wearing spread out armor was even more difficult than carrying the same weight in a heavy backpack. The first couple of years with full-time RA, I used to say it was like every morning I woke up at the bottom of a mountain, carrying a heavy backpack. Just going through my day was like lugging that backpack uphill all day. The disease worsens gradually, but you eventually stop the constant comparing of life now to life before RA. I hadn’t thought of the backpack in a while. It’s still there, but I don’t think of it anymore, something invisible we carry around that we can’t put down. The armor just seemed like one good way to explain what it’s like for us RA Warriors to push through every day. Maybe the Rheumatoid Patient Foundation should get a set of armor for others to borrow for simulating the RA experience? Of course, real warriors have the added difficulty of walking around with multiple joint “injury.” You can’t simulate that pain. NOTE: I sent out a new Spear newsletter last week. If you didn’t get one you can sign up here and yours will come right away. You just need to click on the confirmation. To keep them spam free, names are deleted who bounce or don’t confirm. Please be sure to find yours to open and read – I can’t resend! rawarrior great blog post as usual Kelly – isn’t it the middle of the night there tho, your supposed to be asleep! Kelly, Sounds like that arthritis suit that you posted the video of before! When I read this I had to go and find it again. I wish every doctor had to wear an arthritis suit for at least a day before they sent them off to treat us. While it can’t share the pain and swelling and fatigue it can share some of the stiffness and disability that is so invisable. Yes, there is a link below the post to the first post about the suit. We are looking into options for the RPF. Yes, the ice-pick pain is left out of the suit analogy. I can imagine a lot of debate over whether its moral to inflict such pain even in the interest of science, but if it were voluntary… ? Great article. The only issue that I would take with this was that all of those medieval warriors were trained since childhood to be able to wear that armor which meant that the were conditioned to it and most likely didn’t feel the effects as time wore on. Otherwise I’d say it was a great comparison. There is a difference, though, between a medieval warrior and us: a knight is very well protected and can really only be injured or killed in a few places, such as the eye slit and the neck, and depending on the type of armor, under the arms. Unfortunately, I feel much more vulnerable! You touch my shoulder or my hands or my feet and you might turn me into a weeping mess some (most) days. excellent point! we learn as much from the distinctions as from the analogy! Thank you!! W/ Rheum disease, the armor itself is injuring us from the inside. Thank you for posting this. It is always helpful to have someone with the disease describe it so that others can better understand. I’m going to post this for my friends and family. I think sometimes they just thinking I’m whining when I talk about the constant fatigue and pain – like it’s all in my head and I could get over it if I tried. I need help reminding them that RA is real and life changing. The warrior with armor is similar to a description I have often used, which is of the Tin Woodsman from The Wizard of Oz. For me, the way joints can suddenly stiffen to the point of being frozen feels just like what he looks to be experiencing, and I so want someone to bring that oilcan to loosen each joint up and let me move! I often use the tinman analogy as well. My husband says he wishes he had an oilcan to make me feel better 🙂 So he’s my Dorothy, haha! That’s a perfect description for how I feel most days. Like I’m wearing a suit of armor. And the more I do, the weaker I get. And it takes forever for me to recover. Would be nice if my rheumy appointment on wednesday finally sheds some light on this. I hope the appointment goes well, Erin. It actually went really well. Still have to wait on some new labs, and things were a bit complicated by the last rheumy I saw not forwarding my labs. But I have a new med to try, pilocarpine for the dryness! And maybe start low dose prednisone after the labs come back. Don’t think RA, since there’s no swelling. At this point, I don’t care what it’s called as long as I can get some relief! I’ve only been dealing with this for 10+ years, since I was 18. How interesting to read this post this morning….I’ve had a particularly rough summer with constant pain and swelling and just yesterday after a frustratingly painful day out with my family, I told my husband my feet felt like they were wearing concrete blocks and that my upper body felt like I’d been lugging a tremendously heavy backpack but after arriving home, i was unable to take off the heavy pack and concrete. A suit of armor is an even better comparison!! I feel so alone—-my husband doesn’t understand even when I use terms like “concrete shoes” so it is kidna nice to read your post and all the comments and know there ARE others who DO understand the pain and fatigue of fighting RA all day long, every day. I loved this blog so much. Now I have a way to at least verbally explain to people how difficult it is and how much energy it uses up to do the “simplest” things. I got ready for work this morning and when I got in my car I was relieved to just sit there a minute or two and rest before I left to head to work. Showering and getting dressed made me exhausted. “Normal” people have no idea what that’s like. Great analogy! I get so much comfort and validation from this site. Wouldn’t it be great if we had some kind of convention where we could all get together once a year(or or couple of years). It would add a whole other layer of interaction that you just can’t get over the internet. For example:I saw a video of you somewhere on the site(can’t remember the topic), but I had this HUGE moment of realization and self acceptance when I saw your children bring you your laptop and a few other things you needed as you sat on the couch about to do some work for the site. The reason it was so powerful for me is that my kids do exactly the same kinds of things for me, but I agonize over it. Seeing (really SEEING not just writing or talking about) someone else who I really respect having to rely on her family the same way finally made me able to accept that it is okay. THANK YOU KELLY! I think if as many of us who were able could get together for some kind of in person convention, so many positive things along the line of my AHA moment could happen. Sorry, this was a little off topic-didn’t know where else to put it! This article describes what I am experiencing at the present. Have just read this description to my husband & I think he understood. He has been wondering “where his wife has gone?” This present flare is the worst I’ve had so far despite starting Azothioprin a couple of months ago. I hope there is some improvement soon. I hope so too, Jackie. & I’m glad he is listening! So true Denise. Rusty makes a good picture. Someone’s words last week took me back to that backpack notion and i think I should write more about this.